The skyscraper index tells us that tall buildings and the market are closely correlated—and the unlucky ones being built during a catastrophic economic crisis run the risk of remaining incomplete forever. Such was the case with Sathorn Unique. In fact, the concrete structure is accessible to anyone who wants to explore it—you can even visit the upper floors—which remain the most exposed—where the luxury suites were once planned. Today, weeds and shrubs have cracked through the concrete floors and wound their way up unfinished columns, rebar still sticking up like uncooked spaghetti. But be forewarned: "Getting to the top terrace of the building is possible," says alternative travel guide Exploguide.com, "but it is absolutely not a good idea, and the structure is fragile and bares many holes in the floors." Images by IMP1 and Axel Drainville. 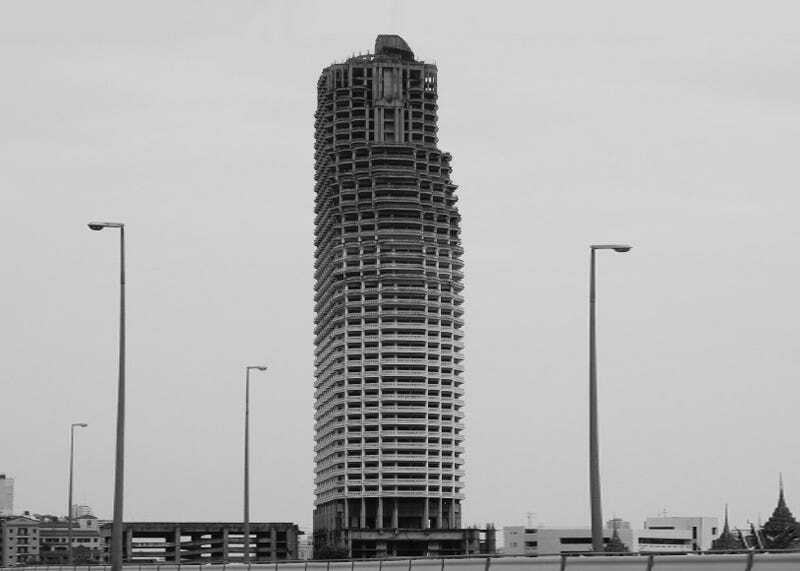 Sathorn is far from the only unfinished tower in the world. From the US to North Korea, there are dozens of half-built skyscrapers all over the world. In some cases, flexible neighbors take advantage of the space—in Caracas, for example, a 45-story unfinished tower hosts thousands of squatters, some of whom have even installed windows and TVs. But in more cases than not, they sit unused—crumbling, attracting crime, and posing serious risks to the surrounding community. Is there such a thing as a skyscraper rescue plan?